B2B companies have used the holiday season as a prime way to connect on a personal level with prospective customers. But with buyers expecting sellers to speak on their terms, B2B orgs are upping the ante to engage customers with relevant, holiday-inspired messaging. Companies such as Vidyard, Content4Demand, Sigstr, LinkedIn and PathFactory are taking this holiday season as an opportunity to provide a personal touch to their brand presence — while also thanking their current and prospective customers with quality content to help them meet their business goals. When done correctly, B2B organizations can spread some relevant, meaningful holiday cheer to their audience. Check out some of the great examples below. To get in the holiday spirit and show off some of Vidyard’s new features, the video marketing platform company created a personalized holiday video in 2017. The video, which included a catchy subject line of “Jingle Bells, Email Smells, Video Saves The Day,” was sent to roughly 80,000 people and garnered more than 10,000 views in just a few days. Since then, it has amassed more than 25,000 unique views and became one of the company’s most viewed videos to date. According to VP of Marketing Tyler Lessard, the email promoting the video saw a 35% higher open rate than the industry average and a 157% higher CTR rate. 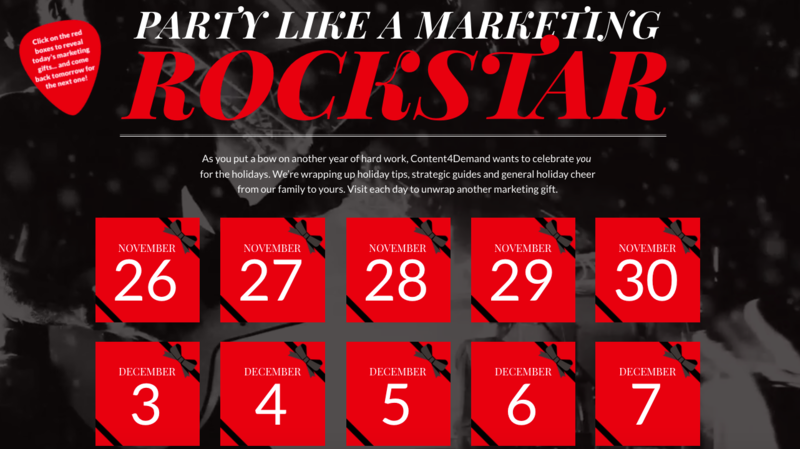 This year, Content4Demand released a holiday calendar, titled “Party Like A Marketing Rockstar,”— a gift that keeps on giving all month long. The calendar — which started on November 26 and will continue until December 21 — includes daily tips, videos, guides and more to help B2B marketers turn their content into timeless hits. The calendar includes both new and popular, previously published content, as well as a mix of short-form and more in-depth pieces, according to the agency’s Content Operations Manager Holly Celeste Fisk. Fisk’s favorite is the “Naughty & Nice” video series, where the Content4Demand team offers expert advice on topics such as content quality, audits and preferences. Thus far, the calendar has received nearly 300 views and more than 1,300 interactive clicks. Creating holiday content doesn’t always have to be a huge endeavor. Sometimes, it can be as easy as tweaking existing content or competitions for a more festive theme. Sigstr, for example, brought back its SDR Wars this holiday season with a “12 Days of Christmas” twist. The competition, aptly titled “The 12 Days of Sales Dev,” pits sales development reps from around the world against each other to see which company has the strongest outbound team. From December 3-18, 18 teams competed in daily challenges such as most creative touchpoint, highest call connects, best bloopers and more. According to Sarah Harbison, Senior Director of Sales Development and Enablement at Sigstr, one winner was announced at the end of each day and the overall winner of the competition has yet to be announced. The company said the goal was to elevate the work of sales development teams and provide a fun, gamified space for networking with peers and learning from each other’s successes, as well as mistakes. In the case of the best bloopers challenge, one team shared that they thought they had been texting a prospect, but later learned it was the prospect’s mom. During the holiday season, nothing is better than providing the gift of quality information to help marketing and sales reps do their job better. LinkedIn Sales Solutions took a similar “12 Days” approach like Sigstr, in which the company shared 12 sales prospecting best practices throughout the month of December. The content is made available in a single location, making it easy for readers to catch up on the days they may have missed. The blogs also provide options for readers to gain in-depth insights into sales prospecting strategies by offering a full, detailed guide. The content has a different tone thanks to the holiday theme, enabling LinkedIn to provide valuable tips and best practices while practicing what they preach. Last but not least, the holiday season represents a time when bundles and bundles of gifts are shared with friends and family. Similarly, PathFactory is sharing a bundle of content with their audience as a gift this holiday season, including tips and best practices highlighting how practitioners in the space are working to keep buyer's attention once they are engaged. To share their brand’s personality, the company wrote a wonderful spin off Mariah Carey’s Christmas classic “All I Want For Christmas Is You” to focus on how all sales reps want from marketing this holiday season is quality leads. A 2019 outlook on how marketers must do more with the moments they have with potential customers.